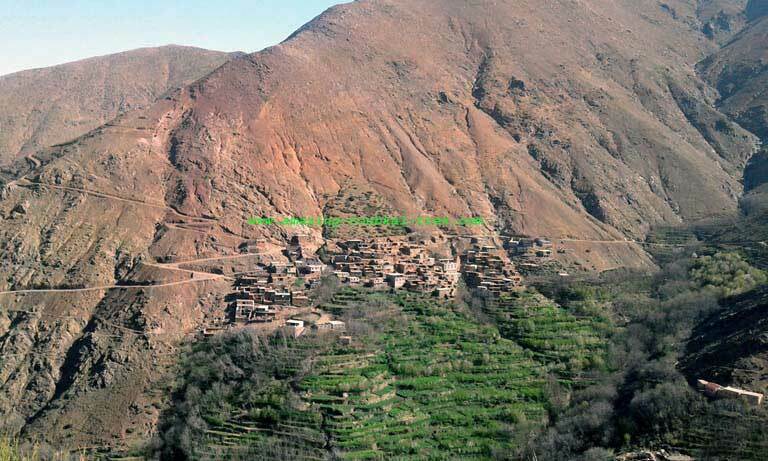 Berber village life experience: 4-day hiking tour in the high Atlas mountain to experience the real Berber village life, and get to know the way of life. The hike starts off in the stunning Imnane valley that is known for the small villages that are carved into the side of the hills. During this hike, you will enjoy mint tea with the locals and stay in a traditional Berber homestay. The Berber people are significant because they are ancient people that were around before the arrival of Arabs and Islam. Their lifestyle is shaped by the magnificent, yet dangerous environment that they live in. The diet of the Berber people has to keep them healthy enough to deal with living on a mountain, consisting mainly of bread, soups, and barley products in general. 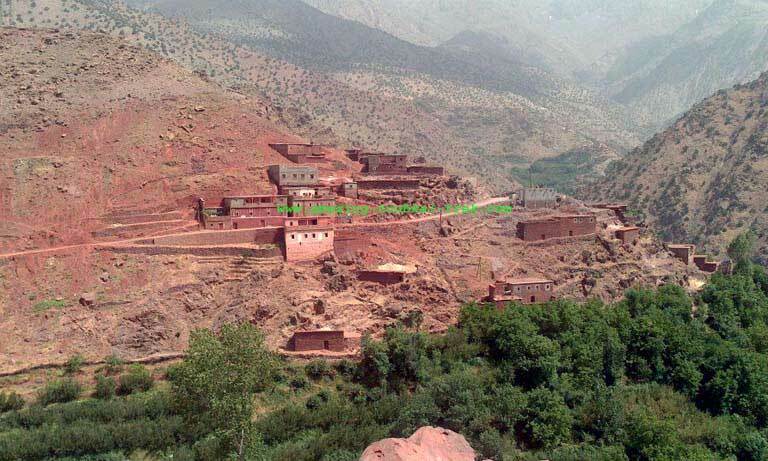 Many homes in Berber villages are made of clay, which is a combination of stone and mud. Their marriage celebrations can even last up to a week, and villagers from all around the area of the celebration are invited. On the first day of the Berber village experience trip, we will trek nearly 6 hours of the day. We will start at Imlil and head towards the Imnane Valley, where we will arrive at Tizi N’tamater (2,300m) for lunch. From there we hit the trail again on the way to Tachdirt where we will spend the evening in a guest house. In the morning we head off from Tachdirt and will go towards the red village at Imsker while passing through many smaller settlements in the Imnane Valley. At night we will rest in gites (French for locally-owned houses) after the long 5-6 hour trek for the day. Another 6-7 trek through the mountains will have you crossing the Imlil Valley, and heading all the way up to Tizi N’Tacht (2,100m). Tizi n’libour is the perfect spot to enjoy lunch while taking in the beauty of the Azzenden Valley. The trek then continues towards Tizi Oussem where we will rest in gites again. Tizi Oussem also has a hammam you can try out, which is like a type of steam bath that the locals use. The final day consists of another 5-6 hour trek. We will head towards Imlil and encounter a massive, breath-taking waterfall, and meet up with the supply mule in Tizi Mizik (2,500m). After lunch, it’s time to head back to Imlil where the trip will end. This Berber village life experience will take you across the three valleys and through Berber Villages. 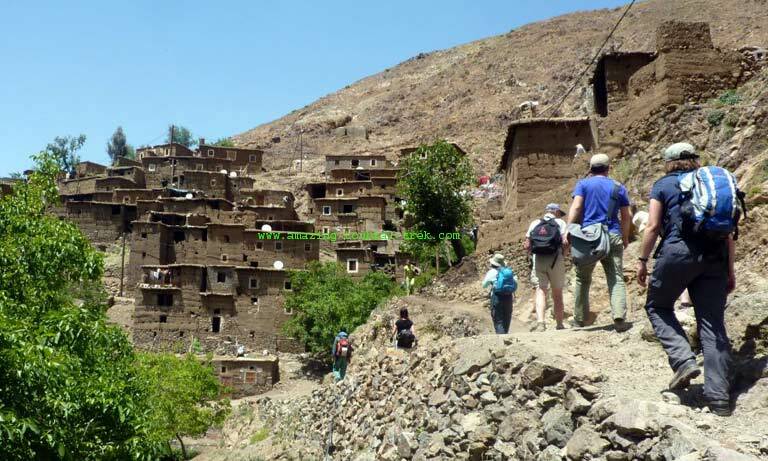 Berber Village Life Experience, Hiking Tour in the High Atlas Mountain.